A couple of months ago, my cherry lime rickey cupcakes were chosen buy Quirky Cupcake Laurie as the winner of the first-ever Cupcake Hero event! What an honor! Unfortunately, I wasn’t able to come back and defend my title for last month’s clove edition. I did make two different types of cupcakes for it and both were awful! Well, I’ve put that mess behind me and come back with a vengeance for this month’s event with a cranberry theme. My inspiration for these cupcakes is the Cranberry Bliss bar that Starbucks sells around the holidays. Yes, even in Australia you can find these in the display case at this time of year. If you are a seasoned Cranberry Bliss bar eater, you will probably recognize me for the fraud that I am. I have never had one…don’t even know what’s actually in one. So this is a loose interpretation, containing things that I think are blissful with cranberries! I seem to be a fan of filled cupcakes lately (there were the rickeys, the Bostinis and the linzers), and I knew I wanted to make a cupcake that would be filled with Thanksgiving-style cranberry sauce. I actually even used my leftover sauce for this! The bar from Starbucks has a cake or cookie base that looks to contain brown sugar, so I went poking around for a brown sugar cupcake recipe. I found one from Nigella, the beautiful Domestic Goddess, for burnt butter brown sugar cupcakes. I liked the sound of that–brown butter gives beautiful flavor to baked goods. I also liked that the batter is quickly blitzed together in the food processor…not a lot of technique involved there. The Bliss bars also appear to have a white chocolate topping, so after baking and filling my cupcakes, I frosted them with a white chocolate whipped ganache, into which I had folded toasted pecans and dried cranberries. 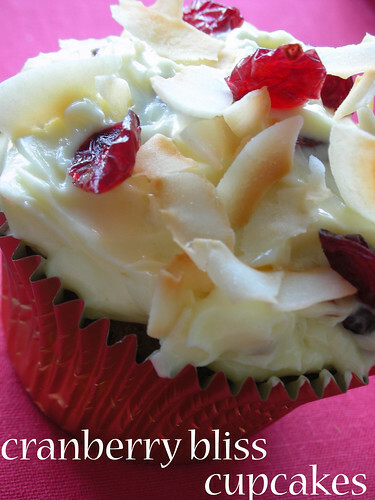 I sprinkled some toasted unsweetened coconut flakes and more dried cranberries over the top to finish. Lush! The tart cranberries really balance out the sweet frosting and cake. And the next day, cold out of the fridge, OMG! My brother declared the cold cupcake to be “f-ing amazing” (please excuse his language). Thanks, Laurie, for another fun event! Can’t wait to see December’s theme! -Make and chill the cranberry sauce filling (recipe below). -Bake and cool a batch of burnt butter brown sugar cupcakes (recipe below). -Make the white chocolate whipped ganache frosting and flavor it with pecans and dried cranberries (recipe below). -To fill the cupcakes, use a small knife or round cookie cutter to cut a plug out of the center of each (going in from the top). Save the top bit of each plug. Fill each cavity with cranberry sauce filling. Cover with the top bit so the filling is not exposed. 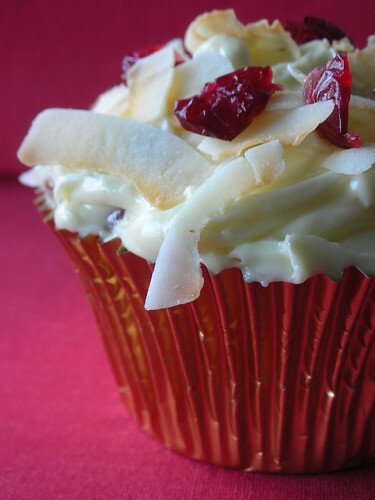 -Top with whipped ganache and garnish with lightly toasted unsweetened coconut flakes and more dried cranberries. -Bring sugar, water, orange zest and a pinch of salt to a boil in a medium saucepot. Reduce the heat to a simmer and add in the cranberries. -Simmer about 10 minutes, stirring occasionally until the cranberries pop. -Transfer to a nonreactive bowl and cool to room temperature. Refrigerate until using. -Preheat the oven to 400°F/205°C and line a muffin tin with paper cups. -To brown the butter, put it in a small saucepan on medium heat, leaving it until it turns light golden and has nutty-colored brown bits on the bottom (will only take a couple of minutes). Take the pan off the heat and pour the butter into a bowl or cup, scraping the brown bits (if you have accidentally gotten your butter too dark, strain it, leaving the dark sediment behind). Let the butter begin to solidify again, but you need it to remain soft for the cupcakes. You can do this by either leaving it at room temperature, which will take awhile, or putting it in the fridge for about 10 minutes. You want it to be the consistency of regular softened butter. -When the butter is solid but still soft, put all the cake ingredients except the milk in a food processor and blitz to a smooth batter. As normal, add the milk down the funnel, pulsing sparingly to form a soft, dropping mixture. -Divide among the paper cups, and cook for 15-20 minutes. FYI, this does not make much batter, and the cups will not be very full. Don’t worry, as the combination of self-rising cake flour and baking powder give it a lot of oomph in the oven. They should rise to normal cupcake size! -Put chopped white chocolate in a medium bowl. Bring cream to a simmer in a small saucepot. Pour hot cream over the chocolate and let stand for 5 minutes to begin to melt. Gently whisk chocolate and cream together to form a perfectly smooth ganache. -Cover and refrigerate for about 45 minutes, until the ganache is cool and begins to firm up, but is still soft enough to whip. -By hand with a whisk, whip until fluffy frosting consistency. Whip in the soft butter, piece by piece. If it starts to look split, chill it a couple more minutes and it should come together with a few more strokes. Don’t overbeat the frosting, however, or it may make it too firm. -Gently fold in pecans and dried cranberries before topping the cupcakes. These do look blissfully delicious! 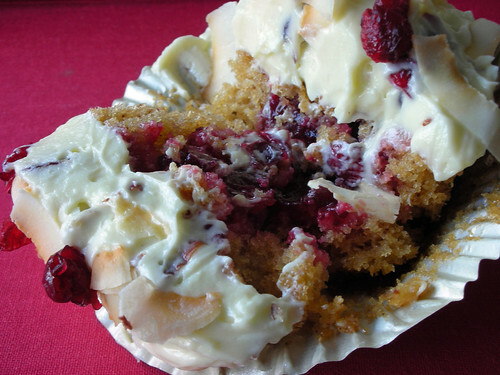 I haven’t thought of cranberries for cupcakes…only muffins. The filling looks like it wouldn’t be too sweet, which I like. Thanks! Amazing photos! I sampled the Cranberry Bliss bar just this morning, so I’m anxious to try your recipe! 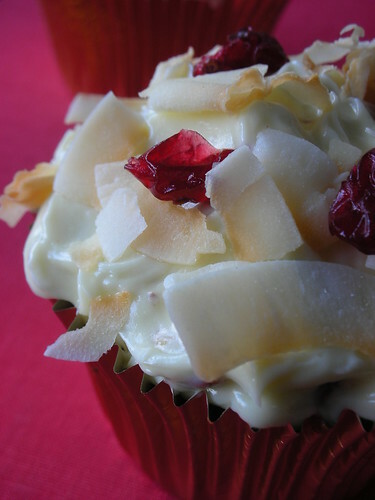 Cranberries have antioxidants, which means we can eat these cupcakes guilt-free! Your cupcakes are so beautiful! I love the coconut. I just had some dried cranberries for a snack. I would have much rather had them on top of that cupcake. these look very festive. sounds delish. thanks for the tip on corn syrup. i haven’t done much challenging baking so i might be back for some tips on where to get supplies in sydney. Oh, what I would do to have one of those right now; looks delish! Never had the ar itself but I’ll start with these instead! They look out of this world!! Those cupcake photos have me drooling! They look great. As much as a challenge as these were, I still had a lot of fun making them! And again — that frosting! It’s awesome. My husband loves the Cranberry Bliss Bars. I will have to make these for him! These look unbelievable. Ever since I baked cranberry muffins, gluten free, for my husband, I have expanded my baking with cranberries. I have to try this one. Thanks for sharing. This cupcake creation looks terrific and delicious. I am going to make some tonight adding my cupcake bliss secret and if they pass my test kitchens approval then I will have to add them to my menu and put them on my website. I didn’t use this cupcake recipe but I did use the filing and the frosting and OMGOSH they are so good! I can’t wait to share them at work on Monday! Any variations on making these low calorie? Not really, but feel free to experiment. Making a cream cheese icing with RF cream cheese might help cut back. I’m getting ready to make these now. Think there would be any reason they wouldn’t freeze well? Trying to get jump start on Thanksgiving chaos. hi. I freeze cupcakes all the time, so I think they’ll be fine. I’d only freeze the cake part though. the filling you can definitely make ahead of time and refrigerate. the frosting, I’d probably make and use day of. It’s just the cranberry sauce, so I always do it to taste/desired consistency (adjusting it won’t throw off the chemistry). I do a tablespoon less of each water and sugar. Taste the sauce…of it’s not sweet enough for your tastes add in the extra tablespoon. Or if it’s too stiff, thin it out with the extra tablespoon of water. Why so rude? If you can’t ask a question nicely then may I suggest figuring it out on your own or don’t try.